Last century, while at medical school, I studied the various models of grief. There was a 5 stage model, a 7 stage model, the Kübler-Ross Grief Cycle and a couple of others, the details of which didn’t deposit firmly enough in my memory bank to now recall. Grief is messy. There is no right or wrong. There is no neat stepwise process or clear signposts along the road. Everyone does it differently. I learned about Grief’s complexities and idiosyncrasies firsthand, very soon after medical school. In the November of my intern year, my partner, Adam, died of testicular cancer. I continued to get better acquainted with Grief over the next 15 years, thanks to multiple personal losses, including five miscarriages. So when I lost my infant daughter, Amalie in December 2014, I thought I knew what to expect. But as it so often does, Grief threw me a few curved balls. I discovered that not only do different people grieve differently, but that individuals grieve differently at different times. Previously, I hadn’t found ceremonies around loss particularly helpful. While respecting the cultural importance and religious significance of grieving rituals, I hadn’t experienced their healing power. Until now. On reflection, I think the key for me was in the timing. Within a couple of months of losing Amalie, life around me had ostensibly gone back to normal. Most people were treating me as if nothing had ever happened. In a way that was good, as I didn’t want to be wrapped in cotton wool, but on the other hand, it accentuated how far from normal I felt. I often felt quite isolated, cut off from the world as if I was trapped in a Perspex container watching everyone go about their daily lives but not being able to connect with them. The colour had been washed out of my life. I felt flat and empty. 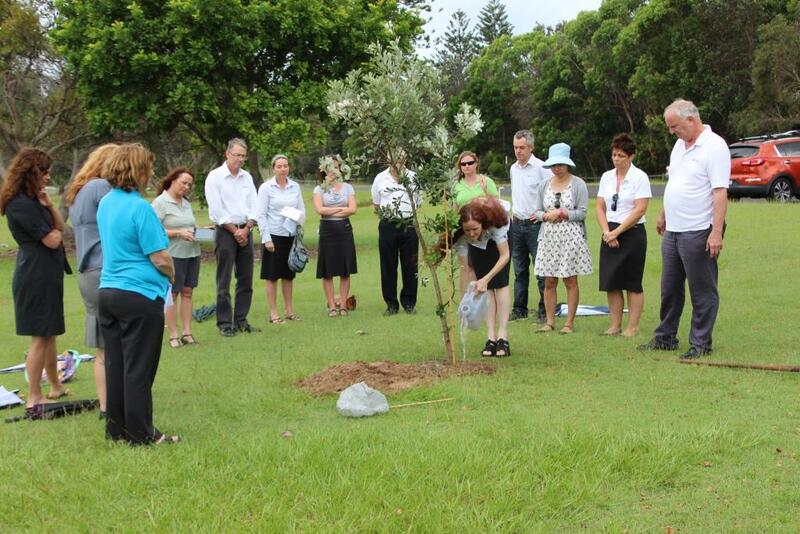 Then three months after Amalie died, my colleagues organised a tree planting and memorial service. After getting council approval, we planted a coastal banksia tree in parkland near where I live. It was a really beautiful service. A few people talked and many people cried. The skies cried too (a few brief showers which gave way to sunshine) and the birds sang. I scattered some of Amalie’s ashes in the roots of the tree as it was planted. It was an exhausting day but the ceremony was exactly what I needed at the time. As well as the symbolic value, it reminded me that people really do care – the love and support by those present (in person and in spirit) was palpable, and it meant the world to me. After feeling increasingly disconnected, the emotional distance between me and those around me was all but obliterated. Connection is a powerful healer indeed. I’ve been visiting Amalie’s tree daily since the service. Visualising her ashes being incorporated into the root system of the tree as it grows and strengthens is comforting and meaningful beyond words. I’ve woken up each morning since the service feeling that little bit lighter and more positive about the future. I know there are still hard times ahead, but I’m ready to face them, knowing my family, friends and colleagues are there to help me through them and to catch me if I fall. I still don’t have any answers for my past-medical-student self, but I feel I’ve got to know and understand a new facet of the complex creature that is Grief, and for that I am grateful. First Published by Sands Australia on 30th April, 2015. Thank you. Thank you for coming into my life and bringing me more joy, peace and fulfilment than I thought possible, albeit only for six short months. I felt you move inside me, and part of me wished I could kept you there, protected, forever. I would have done anything, anything at all if it meant harm did not befall you. But alas your life journey was tragically short, nipped in the bud. I was lucky. We spent several months together. The rest of the world only knew you for a few short days. But the ripples from your arrival and departure are still being felt, by so very many people. There have been trees and flowers planted in your name all over Australia and beyond. Like this one. They will grow and flower, celebrating your life. And my hope is that as they are tended, they will not induce sadness in those gardening, but instead, gratitude and wonder at the blessings your short life has reminded us we have. You Dad, Nanna, Granddad and I will feel pain too, that is inevitable. Pain that we will never get to see your first steps, your first day at school, your first love, your first heartbreak. Pain that you will never know much love you can feel for a child growing inside you. But pain is not only inevitable but invaluable for a full and fulfilling life. The lows give life contrast and context. They help breed resilience, empathy and humility, and these are some of life’s most important skills. So much comes down to attitude. I won’t complain because roses have thorns, but instead rejoice because thorns have roses. You are my rose, Amalie. My perfect little daughter. You made me feel whole… complete… for the first time in my life. You were the piece of the puzzle I didn’t fully understand how much I was missing having – the piece that rendered almost everything else in my life insignificant in comparison. I understand so much more now- about myself, about motherhood, about the world. And for this, I will be eternally grateful. That is a really nice reflective piece. I never liked having stages spelled out when it came to human nature and reaction but see that it serves a purpose for a minimum standard of understanding. Your reflection and experience is the real heart of loss and love and coping. I am not sure if we ever recover. Thank you for your kind and thoughtful words, John. A wonderful reflection on an important aspect of grieving from a fellow GP. Thanks Genevieve.